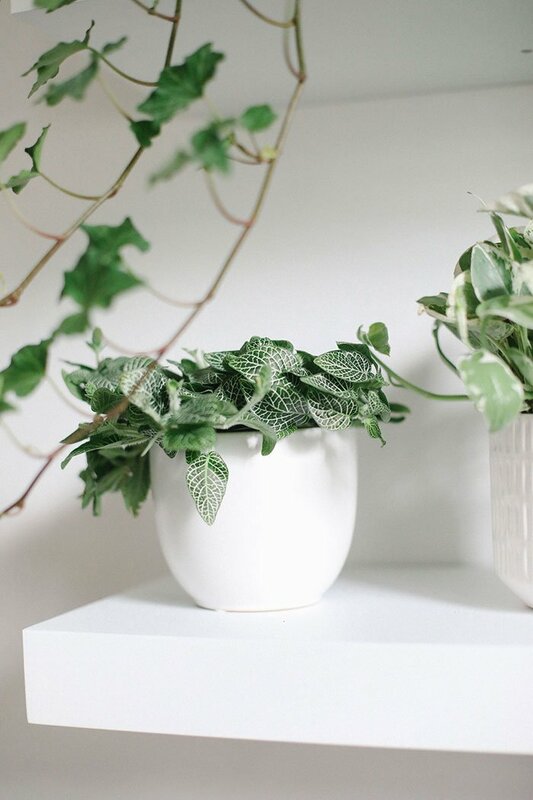 Looking to build a gorgeous, oxygen-filled plant wall in your home? This guide will teach you exactly how to do it. From how to space your shelves, to what plants to buy, we’ll give you a step by step in building yourself an indoor living wall! Choosing a wall that you want to turn into an indoor living wall is simple, but also very important because this will dictate the kind of plants you will purchase in step 4. We recommend finding a wall that gets indirect sunlight, meaning sunshine does not directly shine on it. For example, we have our plant wall on an adjacent wall to an east facing window. East-facing light is not as long or strong as west-facing because it’s morning light. If you can not find a wall that gets low or indirect light, have no fear, you can still build a plant wall, however, your plants will be a lot needier and will likely vary more with watering schedules. Now it’s time to purchase your shelves! The size of your room will dictate how long your shelves should be. The larger your room, the longer your shelves. The Fit Foodie office is on the smaller side, so we purchased 36″ white floating shelves from Overstock, but you can pretty much get shelving anywhere and everywhere. Just make sure that the shelves you buy are deep enough. 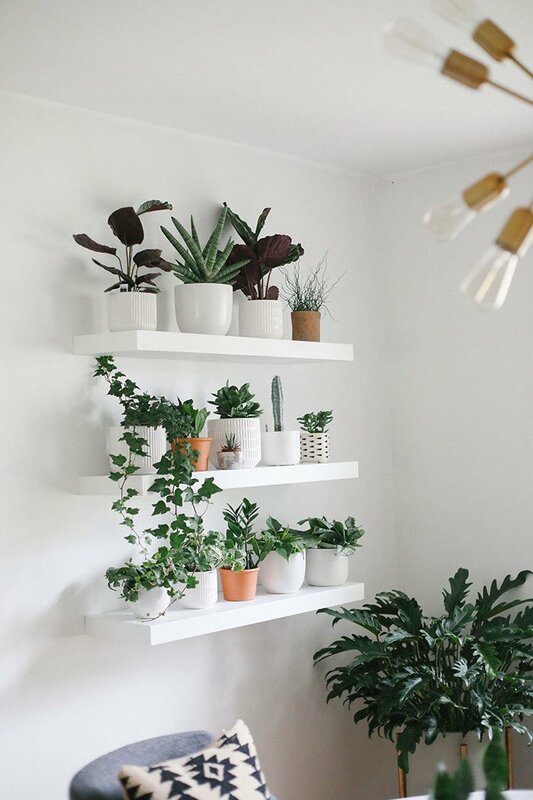 I recommend finding shelves that are at least 8″ deep (ours are 10″) so that you have enough space for the pots. Place the center shelf at around 56″ above the floor. Space your shelves above and below the center shelf 12″ apart. This will give you enough room to have a few medium-sized plants. Pots pots pots! 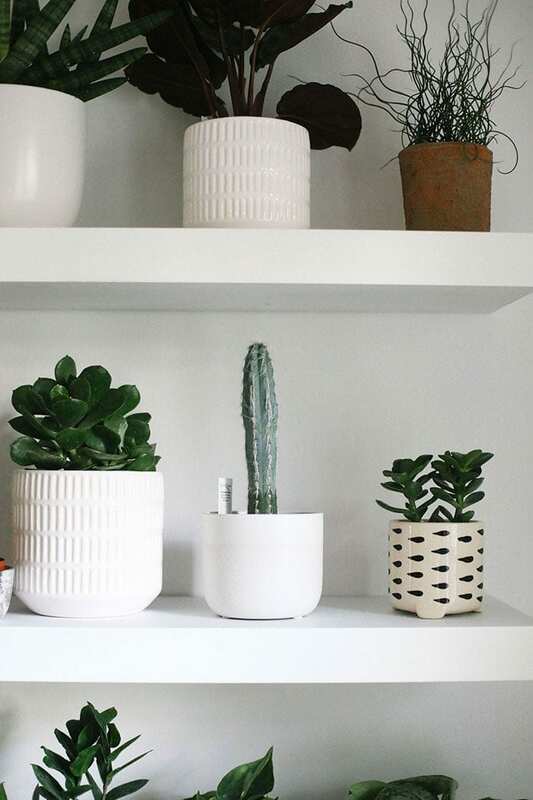 There are so many amazing places to find pots these days and we recommend getting a variety of sizes in order to give some personality and texture to your plant wall! The pots in our plant wall range from 3.5″ tall to 6″ tall. Your pots will also dictate the size of your plants, so we recommend buying your pots before your plants! The majority of the pots we have are from Overstock. You can check all of out here starting from the top left to the bottom right: Pot 1, Pot 2, Pot 3, Pot 4 (from Tonkadale), Pot 5, Pot 6 (from Tonkadale), Pot 7, Pot 8, Pot 9, Pot 10, Pot 11, Pot 12 (from Tonkadale), Pot 13, Pot 14. The types of plants you purchase definitely depend on where your plant wall is located in your house. Like we mentioned in step 1, our plant wall is located on a low-light wall that does not get a lot of direct sunlight. Therefore, we purchased lots of low and medium-light plants! Typically plants that don’t need a lot of light also don’t need a lot of care, which is GREAT for beginners or for the busy lady. The types of plants you purchase also depend on how big your pots are. This is why we recommend purchasing your pots before your plants! We actually brought our pots with us to purchase plants, so we could see exactly how they would look and make sure we were buying the right size plants! Here are some of our favorite low and medium light plants for your plant wall. PS: these are actually the ones we purchased for our own wall! I’m sure you’re like LEE — we see cacti and succulents on your wall! Truth is, I couldn’t NOT put these two babies on our plant wall. Succulents and cacti both need LOTS of sun…direct if possible. So how will we keep them alive? We’ll move them into direct sun every day or every other day so that they can get the light they need to survive! My last little tidbit about plants- I want to give a major THANK YOU to Tonkadale Greenhouse for providing all of the beautiful plants on our plant wall. I’ve mentioned this before, but I highly recommend shopping local for your plants and we LOVE Tonkadale. Their indoor (and outdoor) plants are so high quality and the staff is absolutely amazing. I’m talking to you, Bethann! If you’re unsure about what plants to buy for your plant wall (or for any reason), don’t hesitate to ask the staff at your local greenhouse. And I will say this 100 times over again, we highly recommend Tonkadale in Minnetonka, MN. If you’re local, check them out! This may be the most important step in the whole process. WATERING YOUR PLANTS. In order for me to be a confident plant lady, I’ve had to kill my fair share of plants. Watering schedules will likely differ between every single one of your plants so please please do your research before you water! Thankfully, most plants come with a little tag inside that tells you what kind of watering schedule they like. 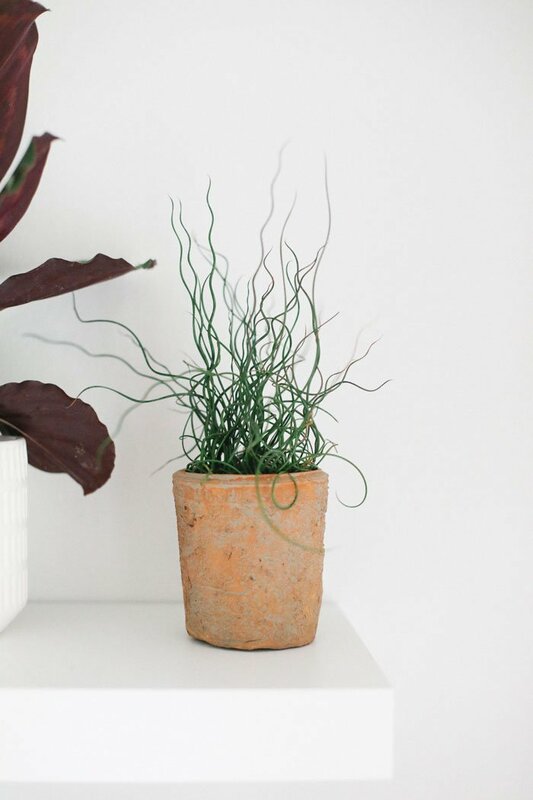 Like Corkscrew Rush, they love moist soil all the time, but Pothos like when their soil dries in between waterings. 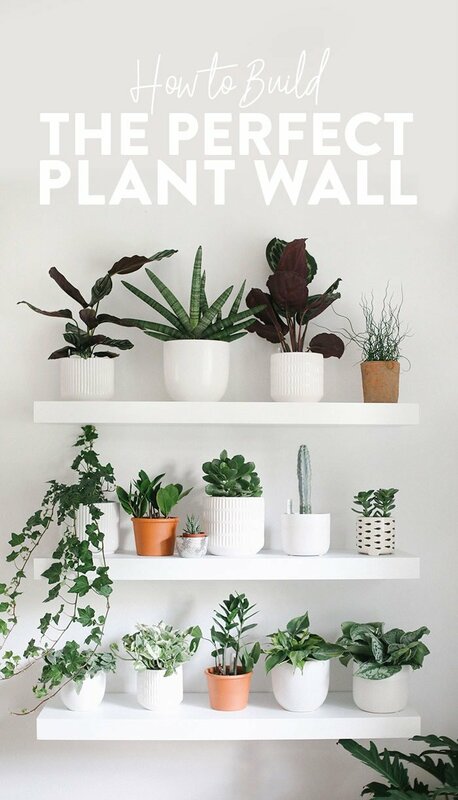 It’s going to take some practice, but just take the time to do some research on when and how much to water for each and every plant on your wall. Disclaimer: This post contains affiliate links. Both Overstock and Tonkadale provided product for this post, but there was no monetary exchange.